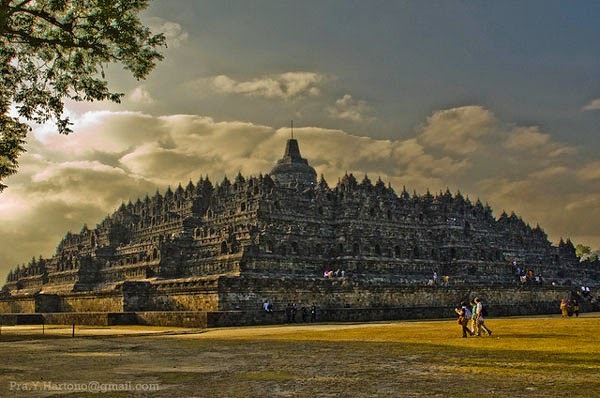 Located on the island of Java, the temple sits majestically on a hilltop overlooking lush green fields and distant hills. It covers an enormous area, measuring 123 x 123 meters. The monument is a marvel of design, decorated with 2,672 relief panels and 504 Buddha statues. The architecture and stonework of this temple has no equal. And it was built without using any kind of cement or mortar! The structure is like a set of massive interlocking Lego blocks held together without any glue. This monument is both a shrine to the Lord Buddha and a place for Buddhist pilgrimage. The ten levels of the temple symbolize the three divisions of the religion’s cosmic system. As visitors begin their journey at the base of the temple, they make their way to the top of the monument through the three levels of Budhist cosmology, Kamadhatu (the world of desire), Rupadhatu (the world of forms) and Arupadhatu (the world of formlessness). As visitors walk to the top the monument guides the pilgrims past 1,460 narrative relief panels on the wall and the balustrades. The whole monument itself resembles a giant stupa, but seen from above it forms a mandala. The great stupa at the top of the temple sits 40 meters above the ground. This main dome is surrounded by 72 Buddha statues seated inside perforated stupa. 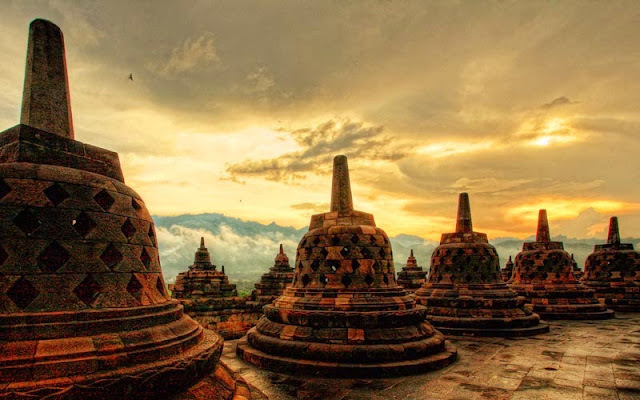 Historians suggest that the name of Borobudur comes from the Sanskrit ‘Vihara Buddha Uhr’ or the ‘Buddhist monastery on the hill’. Guides are available for around Rp 50 thousand. This is a wise investment as a guide will be able to walk you around the site and explain the history of the temple, beginning with its construction during the Syailendra dynasty. The stone carvings attached to the temple display legends and stories which have great philosophical significance. For visitors with children, don’t miss the massive green grass area surrounding the Borobudur site. Borobudur is only one hour’s drive from Yogyakarta, many visitors choose to stay in Yogyakarta where there are a wide variety of hotels, from a simple bed & breakfast to starred hotels. The easiest way to get there is by joining a tour or renting a car. During your journey to Borobudur, enjoy the fresh cool air of Magelang city with its roads lined with big shady trees. 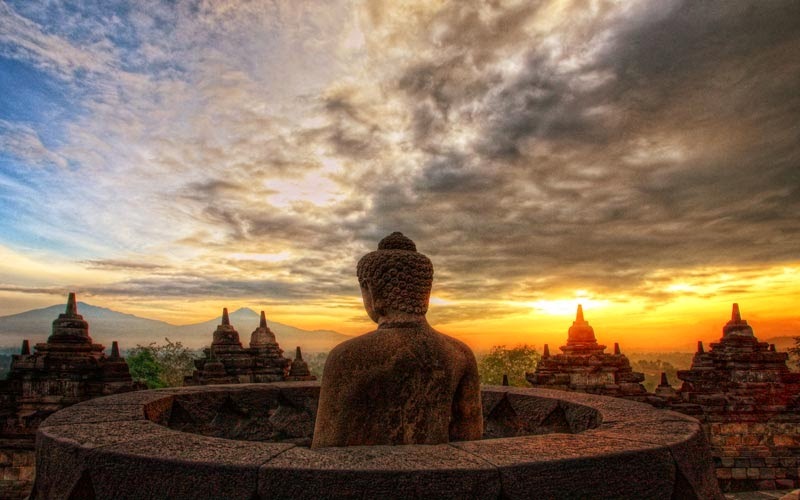 Borobudur itself stands tall against the spectacular backdrop of the Menoreh mountain range that surrounds it.